Conservation experts consider the drill to be Africa`s most endangered primate. 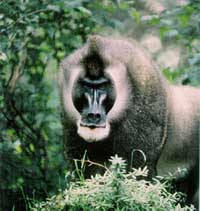 This large-bodied short-tailed baboon roams the lowland and coastal rainforests of Cameroon, Equatorial Guinea and Nigeria. Drills are social creatures and have a highly developed system of communication, including complex visual displays, postures and vocal signals. The drill`s habit of living in groups as large as 20 adults — and congregating in super-groups of up to 200 individuals — makes them a relatively easy target for bushmeat hunters. West Africa`s escalating bushmeat trade has wiped out entire populations of the drill, which now number fewer than 3,000 in the wild. The E-LAW network has joined Cameroonian attorney Samuel Nguiffo in his struggle to ensure that the Chad-Cameroon pipeline project complies with Cameroon`s laws, benefits Cameroonians and is carried out in a sustainable manner. As currently planned, the oil project would not only destroy and fragment the drill`s natural habitat, but would open up previously inaccessible forest tracts to bushmeat hunters. According to Dr. Tony Rose, a primate expert directing the Bushmeat Project at the Biosynergy Institute in Hermosa Beach, California, "the Chad-Cameroon Pipeline Project will become a pipeline for the supply of illegal bushmeat... [and will] merely expedite the trend towards wildlife extinctions and ecosystem collapse." E-LAW U.S. thanks Dr. Rose for providing pro bono scientific expertise to help protect the drill. E-LAW U.S. calls on more than 200 scientists to provide pro bono help to E-LAW advocates around the world. Conservation experts consider the drill to be Africa`s most endangered primate. E-LAW is helping a Cameroonian attorney ensure that a pipeline project does not destroy and fragment the drill`s habitat.